It’s that time of year when having completed their studies, students graduate from colleges and universities. And that means countless commencement speeches given by celebrities and politicians. Rare is the speech that is truly memorable but the following address from Navy Admiral William H. McRaven to the graduates of the University of Texas at Austin is outstanding. 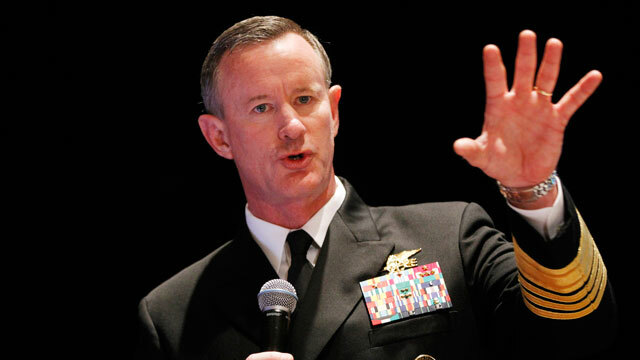 Admiral McRaven serves as the commander of U.S. Special Operations and oversaw the mission that killed Osama bin Laden. Following is the text from his commencement address. But, if every one of you changed the lives of just ten people – and each one of those folks changed the lives of another ten people — just ten — then in five generations — 125 years — the class of 2014 will have changed the lives of 800 million people. 800 million people — think of it — over twice the population of the United States. Go one more generation and you can change the entire population of the world — 8 billion people. But, if you think about it, not only were these soldiers saved by the decisions of one person, but their children yet unborn – were also saved. And their children’s children — were saved. Generations were saved by one decision — by one person. Well, I am confident that it will look much, much better, but if you will humor this old sailor for just a moment, I have a few suggestions that may help you on your way to a better a world. And while these lessons were learned during my time in the military, I can assure you that it matters not whether you ever served a day in uniform. It matters not your gender, your ethnic or religious background, your orientation, or your social status. I have been a Navy SEAL for 36 years. But it all began when I left UT for Basic SEAL training in Coronado, California. Basic SEAL training is six months of long torturous runs in the soft sand, midnight swims in the cold water off San Diego, obstacles courses, unending calisthenics, days without sleep and always being cold, wet and miserable. It is six months of being constantly harassed by professionally trained warriors who seek to find the weak of mind and body and eliminate them from ever becoming a Navy SEAL. But, the training also seeks to find those students who can lead in an environment of constant stress, chaos, failure and hardships. To me basic SEAL training was a life time of challenges crammed into six months. Every morning in basic SEAL training, my instructors, who at the time were all Vietnam veterans, would show up in my barracks room and the first thing they would inspect was your bed. If you did it right, the corners would be square, the covers pulled tight, the pillow centered just under the headboard and the extra blanket folded neatly at the foot of the rack — rack — that’s Navy talk for bed. If you can’t do the little things right, you will never do the big things right. And, if by chance you have a miserable day, you will come home to a bed that is made — that you made — and a made bed gives you encouragement that tomorrow will be better. Every day your boat crew forms up on the beach and is instructed to get through the surfzone and paddle several miles down the coast. In the winter, the surf off San Diego can get to be 8 to 10 feet high and it is exceedingly difficult to paddle through the plunging surf unless everyone digs in. Every paddle must be synchronized to the stroke count of the coxswain. Everyone must exert equal effort or the boat will turn against the wave and be unceremoniously tossed back on the beach. For the boat to make it to its destination, everyone must paddle. I was in the boat with the tall guys, but the best boat crew we had was made up of the little guys — the munchkin crew we called them – no one was over about 5-foot-five. The munchkin boat crew had one American Indian, one African American, one Polish America, one Greek American, one Italian American, and two tough kids from the mid-west.They out paddled, out-ran, and out-swam all the other boat crews. The big men in the other boat crews would always make good-natured fun of the tiny little flippers the munchkins put on their tiny little feet prior to every swim. But somehow these little guys, from every corner of the nation and the world, always had the last laugh – swimming faster than everyone and reaching the shore long before the rest of us. Several times a week, the instructors would line up the class and do a uniform inspection. It was exceptionally thorough. Your hat had to be perfectly starched, your uniform immaculately pressed and your belt buckle shiny and void of any smudges. But it seemed that no matter how much effort you put into starching your hat, or pressing your uniform or polishing your belt buckle — it just wasn’t good enough. The instructors would fine “something” wrong. There were many a student who just couldn’t accept the fact that all their effort was in vain. That no matter how hard they tried to get the uniform right — it was unappreciated. Those students didn’t make it through training. Those students didn’t understand the purpose of the drill. You were never going to succeed. You were never going to have a perfect uniform. Every event had standards — times you had to meet. If you failed to meet those standards your name was posted on a list and at the end of the day those on the list were invited to — a “circus.” A circus was two hours of additional calisthenics — designed to wear you down, to break your spirit, to force you to quit. No one wanted a circus. A circus meant that for that day you didn’t measure up. A circus meant more fatigue – and more fatigue meant that the following day would be more difficult – and more circuses were likely. But at some time during SEAL training, everyone — everyone – made the circus list. But an interesting thing happened to those who were constantly on the list. Over time those students — who did two hours of extra calisthenics – got stronger and stronger. The pain of the circuses built inner strength — built physical resiliency. But the most challenging obstacle was the slide for life. It had a three-level 30-foot tower at one end and a one-level tower at the other. In between was a 200-foot long rope. You had to climb the three-tiered tower and once at the top, you grabbed the rope, swung underneath the rope and pulled yourself hand over hand until you got to the other end. The record for the obstacle course had stood for years when my class began training in 1977. The record seemed unbeatable, until one day, a student decided to go down the slide for life – head first. Instead of swinging his body underneath the rope and inching his way down, he bravely mounted the top of the rope and thrust himself forward. It was a dangerous move – seemingly foolish, and fraught with risk. Failure could mean injury and being dropped from the training. Before the swim the instructors joyfully brief the trainees on all the species of sharks that inhabit the waters off San Clemente. They assure you, however, that no student has ever been eaten by a shark — at least not recently. But, you are also taught that if a shark begins to circle your position — stand your ground. Do not swim away. Do not act afraid. And if the shark, hungry for a midnight snack, darts towards you — then summon up all your strength and punch him in the snout and he will turn and swim away. As Navy SEALs one of our jobs is to conduct underwater attacks against enemy shipping. We practiced this technique extensively during basic training. The ship attack mission is where a pair of SEAL divers is dropped off outside an enemy harbor and then swims well over two miles — underwater – using nothing but a depth gauge and a compass to get to their target. During the entire swim, even well below the surface there is some light that comes through. It is comforting to know that there is open water above you. But as you approach the ship, which is tied to a pier, the light begins to fade. The steel structure of the ship blocks the moonlight – it blocks the surrounding street lamps – it blocks all ambient light. Every SEAL knows that under the keel, at the darkest moment of the mission – is the time when you must be calm, composed — when all your tactical skills, your physical power and all your inner strength must be brought to bear. It is on Wednesday of Hell Week that you paddle down to the mud flats and spend the next 15 hours trying to survive the freezing cold mud, the howling wind and the incessant pressure to quit from the instructors. As the sun began to set that Wednesday evening, my training class, having committed some “egregious infraction of the rules” was ordered into the mud. The mud consumed each man till there was nothing visible but our heads. The instructors told us we could leave the mud if only five men would quit — just five men and we could get out of the oppressive cold. Looking around the mud flat it was apparent that some students were about to give up. It was still over 8 hours till the sun came up – eight more hours of bone chilling cold. The chattering teeth and shivering moans of the trainees were so loud it was hard to hear anything – and then, one voice began to echo through the night — one voice raised in song. The song was terribly out of tune, but sung with great enthusiasm. One voice became two and two became three and before long everyone in the class was singing. We knew that if one man could rise above the misery then others could as well. The instructors threatened us with more time in the mud if we kept up the singing — but the singing persisted. And somehow – the mud seemed a little warmer, the wind a little tamer and the dawn not so far away. If I have learned anything in my time traveling the world, it is the power of hope. The power of one person — Washington, Lincoln, King, Mandela and even a young girl from Pakistan — Mallah — one person can change the world by giving people hope. Ring the bell and you no longer have to wake up at 5 o’clock. Ring the bell and you no longer have to do the freezing cold swims. To the graduating class of 2014, you are moments away from graduating. Moments away from beginning your journey through life. Moments away starting to change the world — for the better. It will not be easy. Thank you very much. Hook ‘em horns!